James Potter (27 March, 1960 – 31 October, 1981), also known as Prongs, was a pure-blood wizard and the only son of Mr and Mrs Potter. He attended Hogwarts School of Witchcraft and Wizardry from 1971 to 1978, and was sorted into Gryffindor House. When James started at Hogwarts, he met and befriended fellow Gryffindor students Remus Lupin, Sirius Black, and Peter Pettigrew. He also met Severus Snape, a Slytherin student whom he frequently antagonised. During his seventh year, James was appointed Head Boy and began dating Lily Evans. After Hogwarts he married Lily and together they had a son, Harry James Potter of whom he made Sirius Black the godfather. James, Lily, and their friends all fought in the First Wizarding War as members of the Order of the Phoenix; he and his wife defied Lord Voldemort three times. However, James and Lily Potter were forced to go into hiding after a prophecy was made concerning Voldemort and their infant son. Tragically, James and Lily were betrayed to Voldemort by one of their friends, Peter Pettigrew. James was murdered by Voldemort on Hallowe'en in 1981, along with his wife, while they were trying to protect their son. James briefly appeared again in 1998 through the Resurrection Stone, along with his wife Lily and his friends Sirius Black and Remus Lupin. After the Second Wizarding War, James had three grandchildren through his son, Harry Potter; James Sirius Potter, Albus Severus Potter, and Lily Luna Potter, the first of whom was named after his grandfather. James Potter was born on 27 March, 1960 into a pure-blood wizarding family of considerable wealth. Both his parents were elderly, even by wizarding standards, and both died under normal circumstances between 1975 and 1981. Because he was their only child, arriving later in their lives, James's parents pampered him a great deal, so he grew to be arrogant, boastful, and proud, but deep down a good person. Sirius Black: "Where are you heading, if you've got the choice?" James Potter: "'Gryffindor, where dwell the brave at heart!' Like my dad... Got a problem with that?" Severus Snape: "No. If you'd rather be brawny than brainy [...] "
James started his first year at Hogwarts School of Witchcraft and Wizardry in 1971 and was Sorted into Gryffindor house. While there, he befriended Sirius Black, Remus Lupin, and Peter Pettigrew, and together they called themselves the Marauders. Though more mischievous than diligent, James was a very clever student. At some point, he became Chaser for his house's Quidditch team, and he was completely aware of his talent. For the vast majority of his time at school, he was somewhat an obnoxious youth, with a love of showing off and an exceptional self-confidence that bordered on arrogance. According to Lily, he also had a habit of ruffling his hair to make it even untidier, to look as though he had just alighted from his broomstick. James also had a habit of hexing innocent students for no other reason than because he could, especially Severus Snape, a Slytherin in the same year as him. James and Snape had a strong rivalry throughout their time at Hogwarts. Remus and Sirius later explained to Harry that the reason this rivalry began was due to Snape's jealousy over James's talent at Quidditch and his popularity, as well as Snape's interest in the Dark Arts, which James despised. However, it was later revealed that James and Sirius had insulted Snape from the moment they met him in their first year on the Hogwarts Express. Snape followed the Marauders around, looking for reasons to get them expelled. James, in turn, used the hexes Snape himself had made up against him. James spent the majority of his academic career chasing after Lily Evans, an attractive fellow Gryffindor whom he called by her surname. Lily was perhaps the only student in the school, aside from Snape, who was completely unimpressed by James, considering him arrogant and obnoxious. She once ordered James to quit hexing Snape, and James said, "I will if you'll go out with me, Evans." When James took the curse off Snape, Snape, in his humiliation and anger, called Lily a "filthy Mudblood." James demanded him to apologise, but Lily responded that James was as bad as Snape, and she would not date him even if it were a choice between him and the Giant Squid. Snape's friendship with the vivacious and pretty Lily may have sparked envy in James and further fuelled their enmity. As second years, James, Sirius, and Peter figured out that Remus was a werewolf. Rather than abandoning him (James, in particular, insisted this monthly hazard did not mean Remus was truly abnormal), they spent three years learning to become Animagi in order to accompany Remus in his transformations. In his fifth year, James managed to perfect the transformation and become a stag Animagus, which earned him the nickname "Prongs". James presumably collected Chocolate Frog Cards, as, at an unknown time, the History of Magic teacher, Professor Cuthbert Binns, gave him the Circe card, which later came into the possession of Quirinus Quirrell, who kept it in Gringotts Wizarding Bank in Vault 998. At some point in their school years, Snape, who was very interested in where Remus went every month, saw Madam Pomfrey and Remus going to the Shrieking Shack using a secret passage under the Whomping Willow. Sirius had, for reasons unknown, told him that the trick to getting past the Whomping Willow was to poke the knot at the bottom. Snape followed Sirius's directions, and was nearly at the Shrieking Shack when James pulled him back. At great risk to his own life, James saved Severus from certain death at the claws of a werewolf. However, Snape adamantly refused to believe that James would have done him a favour, believing that James had only saved him in order to avoid expulsion, and despised being in his debt. At the age of sixteen, James's parents allowed Sirius to move in with them so he could escape his own horrible family, and Sirius soon became an unofficial member of their family. By his seventh year, James had lost the less savoury aspects of his personality, and was even appointed Head Boy, despite the fact that he had not been a prefect. He also finally managed to impress Lily Evans, and began dating her at this time. He stopped hexing bystanders for fun, though he still secretly hexed Snape, and in turn, Snape never lost an opportunity to hex him back. After graduation, at only eighteen years old, James married Lily, and Sirius served as their best man at the wedding. The three of them, along with Remus and Peter, joined the Order of the Phoenix, in the fight against Lord Voldemort and his Death Eaters. In 1977, he and Sirius were involved in a motorbike chase with two Muggle policemen. Although the chase started off as a bit of fun, it turned slightly more serious when the pair were attacked by three men on broomsticks. Sirius and James used their wands to raise the police car that had been chasing them, and their attackers crashed into it. During the course of the next three years, James and Lily defied the Dark Lord three times, as the war continued. The first was when they refused to join Voldemort's side when he attempted to recruit them. James had inherited vast fortunes from his affluent parents, and hence was able to comfortably support his family without the need for a paying job, meaning that Petunia's supposed lie about him being unemployed was true, although not because he was a drunk. James also used his wealth to support Remus, who was unemployable due to his status as a werewolf. On 31 July, 1980, Lily gave birth to their son Harry James Potter, but it wasn't long before Albus Dumbledore found out that they were in grave danger. Young Harry had become a target of Lord Voldemort, because of a prophecy concerning the one who could ultimately defeat him for good. Voldemort had learned of the prophecy through his follower, an old enemy of James, and the former best friend of Lily, Severus Snape. When Snape learned about Voldemort's decision, he pleaded that his Master spare Lily, thereby putting James and Harry's lives at stake. In October 1981, Dumbledore told the Potters that their best chance of remaining safe against Voldemort was the Fidelius Charm. James insisted on using Sirius as their Secret-Keeper, even though Dumbledore himself had offered to fill the position. Sirius, however, had a different plan. He convinced James and Lily to use Peter as their Secret-Keeper, with Sirius as a decoy. They agreed and the charm was cast in secret, but this attempt at a double-bluff ended in tragedy. The only people to know about the switch were James, Lily, Sirius, and Peter; even Albus and Remus were kept in the dark. Less than a week later, Peter betrayed Lily and James to Voldemort. When the Dark Lord arrived at Godric's Hollow on 31 October, James told Lily to take Harry and run, and stood to face the darkest wizard in a century on his own in order to give his wife and child time to escape, but leaving his wand in the living room, where he had been entertaining his young son with it. Voldemort murdered him with the Killing Curse. Harry: "You'll stay with me?" James: "Until the very end." After James's and Lily's deaths, their son was raised by Lily's unloving sister, Petunia Dursley, and her grumpy husband Vernon, along with their glutton of a son Dudley. Despite not remembering his parents, Harry held them in high esteem. This faltered slightly where his father was concerned, when he learned that James had been something of a bully in his youth, witnessing a memory of Severus Snape's, in which James and Sirius picked on and humiliated Snape simply because they were bored. Snape, who switched sides after Lily's death and became Potions professor at Hogwarts, treated Harry with disdain throughout his academic career, perceiving him to be "arrogant as his father, a determined rule-breaker... attention-seeking and impertinent". Harry saw a vision of his parents in the Mirror of Erised in 1991. Three years later, during his battle with Voldemort in 1995, the Priori Incantatem effect took place, and James and Lily emerged from Voldemort's wand. In 1996, Harry also witnessed a memory of James humiliating Snape back when they were students. In 1998, Harry learned he was a Horcrux of Voldemort's, and walked toward his death in the Forbidden Forest. Upon entering, he used the Resurrection Stone to summon James and others who had perished in the war against Voldemort. James and Lily told Harry that they were tremendously proud of him, proud of his outstanding courage and strength, and assured him that they would stay with him until the very end. Harry described their very presence as his courage, the reason he was able to keep putting one foot in front of the other, with Lily smiling at him, and James nodding in encouragement. He eventually named his eldest child after his father. James would gain two more grandchildren in Albus Severus and Lily Luna Potter. James was a tall, thin man with hazel eyes and untidy black hair that stuck up at the back. During his Hogwarts years, he had an indefinable air of having been well cared for and even adored. As late as his fifth year, he started wearing glasses, although in his first year he had not. His son, Harry, was constantly noted to look very much like him, having the same untidy hair and eyesight, but the shape and colour of his eyes were identical to those of his mother Lily's. Severus Snape: "He fancies you, James Potter fancies you! And he’s not...everyone thinks...big Quidditch hero —"
Lily Evans: "I know James Potter’s an arrogant toerag. I don’t need you to tell me that." James was a clever and talented wizard, but very mischievous in his youth. He could be arrogant and boastful, and even bullied other students on occasion, particularly his long-time rival, Severus Snape. However, even in this stage of arrogance, he still displayed some positive qualities of character: despite being a pure-blood, he disagreed strongly with the concept of blood purity, and was disgusted with any prejudice towards Muggle-borns, and did not hold prejudice towards werewolves (such as Remus Lupin, who was one of his dearest friends). Snape would also point out that James was lazy. He ultimately matured and lost some of his arrogance, and become enough of a responsible student and leader to be Head Boy in his final year, and later a member of the Order of the Phoenix; though he never completely lost his rebellious side, it was clear James had left Hogwarts a far better person than he had been upon entering it. His best quality was his willingness to sacrifice himself for his wife and son, as demonstrated when he told her to take Harry and run while he held off Voldemort, proving himself to be a true Gryffindor. The fact that both James and Lily were once asked by Voldemort to join his Death Eaters shows that he, like his wife, was a very powerful wizard, being able to catch the eye of the most dangerous Dark wizard in history. James was able to conjure a corporeal Patronus (form of a stag), a mark of superior magical ability. One of his dearest friends, Remus Lupin, also stated that he had been one of the cleverest Hogwarts students of his time. Animagus: James was able to become an Animagus at the early age of fifteen, assuming the form of a stag. Being unregistered allowed him to use the ability to his advantage, visiting Remus Lupin during his monthly transformations. Transfiguration: James's wand, a pliable, eleven-inch-length of mahogany, was said to be "excellent for Transfiguration". He was also able to achieve Animagus transformation at the age of fifteen, a testament to his extraordinary talent in the subject, given that the Animagus transformation was a very difficult branch of magic which, as Remus put it, "could go horribly wrong." Quidditch: James was an accomplished Quidditch player, playing Chaser for the Gryffindor Quidditch team during his school years. He was noted to have excellent reflexes, as seen when playing with a Snitch he had taken from the Quidditch supplies. Duelling: James was a skilful duellist. He, along with Lily and the Order of the Phoenix, was able to defy Voldemort himself three times. However, when James and Voldemort met for the fourth time, he was killed quickly due to the fact that he did not have his wand. Charms: James was talented in Charms from a young age, since he and his most intimate friends (Remus, Sirius, and Peter) managed to create the magically-complex Marauders' Map as teenagers. James was also able to cast the highly advanced Patronus Charm: conjuring a corporeal Patronus whose form was identical with his Animagus form, a stag. Potter inheritance: When James' parents died they left him a small fortune, that he would later pass on to his son, Harry Potter. Wand: James's wand was 11" mahogany with an unknown core. The wand was described as "pliable" and "good for Transfiguration", which would later come in handy. Marauder's Map: The map was created by the Marauders between 1975 and 1978. It is a magical document that reveals all of Hogwarts. Not only does it show every classroom, every hallway, and every corner of the castle, but it also shows every inch of the grounds, as well as all the secret passages that are hidden within its walls and the location of every person in the grounds, portrayed by a dot. However, the Room of Requirement is not visible on the map, being the only known area of the castle not to be seen on the Map. Two-way mirror: James owned this mirror during his school years, he and Sirius Black used a pair of two-way mirrors so they could talk to each other while they were in separate detentions. Sirius later gave James's mirror to Harry in 1996. Potters' Cottage: James owned this cottage in Godric's Hallow along with his wife Lily during the final weeks of the First Wizarding War. This is where he and his wife were murdered and his son Harry was marked as the "Boy Who Lived". The cottage still stands as a reminder of what happened that Hallowe'en night in 1981. James was born into a very wealthy, pure-blood family. He had an excellent relationship with his parents, who loved him very much. His father was sorted in Gryffindor, and used to tell him about how the house prized bravery and boldness above all other qualities. James's parents were on the older side when he was born, and died before he was killed in 1981. Lily: "You're as bad as he is [...] "
James: "What! I'd NEVER call you a — you-know-what!" Lily: "Messing up your hair because you think it looks cool to look like you've just got off your broomstick, showing off with that stupid Snitch, walking down corridors and hexing anyone who annoys you just because you can — I'm surprised your broomstick can get off the ground with that fat head on it. You make me SICK." James's relationship with Lily Evans was initially a rocky one. While James was a popular student and talented Quidditch player, well-liked by most, Lily was unimpressed with him; this had to do with James's hostile relationship with her best friend, Severus Snape, and because of James's bad habit of hexing innocent students just for the fun of it. James developed romantic feelings for Lily by his fifth year, and was always going out of his way to try to impress her, only to end up making a fool out of himself most of the time, and she still regarded him as an arrogant bully, treating him with absolute disdain. In their seventh year, however, Lily was finally willing to go out with James, after he smoothed out and stopped hexing people for the fun of it (though she was unaware he still hexed Snape). The two were Head Boy and Head Girl at Hogwarts, and married soon after graduation. James and Lily were both members of the Order of the Phoenix, and together defied Voldemort himself three times. Their son, Harry, was born in 1980. James and Lily had Harry in July of 1980 and loved their son more than anything. On Hallowe'en in 1981 they sacrificed themselves at 21 years old, in order to save him from Lord Voldemort, when he was just an infant. Albus Dumbledore always maintained that Harry's love for his parents and the love they had in return for him, was his greatest power. Harry regarded his parents with great reverence, and fiercely defended their memories. In 1995, he punched Draco Malfoy for insulting his mother, and he frequently became furious with Professor Snape, who taunted Harry that James was not the great man others made him out to be. Snape was, to Harry's horror, proven right in the spring of 1996, when Harry accidentally witnessed James bullying Snape in one of his memories during Harry's Occlumency lessons, via Albus Dumbledore's Pensieve. However, Remus and Sirius assured him that his father was no longer the bully that he once was, having matured and changed his ways, or he would never have become Head Boy, and his mother would have never agreed to go out with him, let alone fall in love and marry him. James: "You are nearly there. Very close. We are… so proud of you." The few times Harry ever saw his parents were through pictures given to him by Rubeus Hagrid, a vision within the Mirror of Erised, spectral forms which came out of Voldemort's wand during Priori Incantatem, stored memories within the Pensieve, and again as spectral forms when he "recalled" them during the Battle of Hogwarts, by using the Resurrection Stone. His spirit was described as "exactly the same height as Harry. He was wearing the clothes in which he had died, and his hair was untidy and ruffled, and his glasses were a little lopsided, like Mr. Weasley's, a loving smile on his face". Both James and Lily told their son that they were tremendously proud of him, for being so brave and strong despite all the pain and suffering he had to endure, and provided him with the support he needed to sacrifice himself to Voldemort. It's also seen that James calls Harry by a name of affection, he has on different occasions referred to him as "son". Harry eventually named two of his children after his late parents and godfather, James Sirius Potter and Lily Luna Potter. Sirius: "That was a noble thing you did back there. He doesn't deserve it." Harry: "Well, I just didn't think my dad would've wanted his two best friends to become killers." While at Hogwarts, James became the very best of friends with Sirius Black, Remus Lupin, and Peter Pettigrew, and the group called themselves "the Marauders". He met Sirius on the Hogwarts Express in their first year, and they seemed to bond quickly. In their second year, when the group discovered that Remus was a werewolf, they refused to ostracize him, as most would, instead learning to become Animagi in order to keep him company during his transformations. James insisted that Remus was not abnormal because of his condition, and later used his wealth to support Remus when anti-werewolf legislation made it difficult for him to get a job. The four friends enjoyed untold popularity while at school, and particularly liked playing pranks together; they also invented the Marauder's Map, and all joined the Order of the Phoenix after graduating from Hogwarts. Although he was very close to all of his friends, James was probably closest to Sirius, whom he loved as a brother and who moved in with James and his parents after running away from home at age sixteen. James also chose Sirius as his best man at his wedding to Lily, as well as his son's godfather. When the Potters became Lord Voldemort's targets in 1981, James was adamant about Sirius being their Secret-Keeper, though he agreed to Sirius's plan to make Peter the Secret-Keeper instead, to throw off the enemy. James's unshakable trust in his friends would be his undoing, as Pettigrew betrayed him, his wife and his son to Voldemort, something Sirius and Remus later attempted to kill him for, only to be stopped by Harry, who thought that his father would not want his best friends to become killers just for a traitor. Dumbledore later assured Harry that his belief had been right, saying that he knew James very well, both at Hogwarts and later, and he was perfectly sure that James would have saved Pettigrew as well. The ending to the three Marauders who had stayed true to their friendship to the very end — James, Sirius, and Remus — was bittersweet: though they all lost their lives to the two wizarding wars, it can be theorised that they were reunited in death, never to be parted again. Harry: "My father was a great man!" Snape: "Your father was a swine!" James met Severus Snape on the Hogwarts Express in their first year at Hogwarts, and the two immediately got off on the wrong foot. James scoffed at Snape's desire that he and Lily Evans would be Sorted into Slytherin house, while Snape sneered at James's hope that he would follow his father's footsteps and end up in Gryffindor. He and Sirius bestowed the mocking nickname of "Snivellus" on Snape at this first meeting. This enmity would continue for the rest of their school years, and, on Snape's part, well after James's death. According to Sirius, Snape envied James's popularity and Quidditch talents, and always tried to get him and his friends in trouble, while James despised Snape's fascination with the Dark Arts. Although James disliked and bullied Snape, he also saved Snape's life, when Sirius played a potentially lethal prank on him by sending him to the Shrieking Shack when Remus Lupin was there transforming. Apparently, though James loathed Snape intensely, he never wanted him dead. However, Snape despised being in James's debt and felt, even twenty years later, that James only saved him to avoid expulsion. 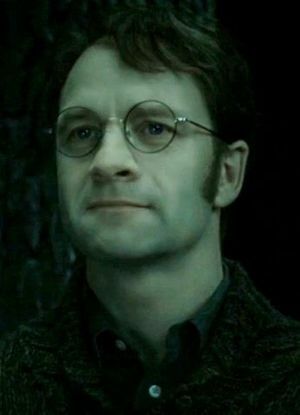 Most of his dislike of James's son Harry was motivated by seeing his old rival in Harry, as well as a constant reminder that Lily had loved another man. Snape was also involved in James's death: Snape was the Death Eater who relayed the Prophecy that foretold the birth of the one who would defeat Snape's then-master Lord Voldemort. When Voldemort was informed of this, he chose to get rid of James, his wife, and their son. Snape intervened by pleading for Lily's life, while ignoring the danger into which his actions put James and Harry. James always had a good relationship with Albus Dumbledore. Dumbledore was the Headmaster of Hogwarts at the time James attended the school, and he became fond of James, knowing that, despite his being an arrogant, highly mischievous trouble-maker, he was also a kind-hearted, good-natured person. James became a member of the Order of the Phoenix, an organization founded by Dumbledore, during the First Wizarding War, and fought in several battles with him. Dumbledore also attempted to protect James, Lily, and Harry from Voldemort, who was out to kill their son, by offering to be their Secret Keeper. However, the role of Secret Keeper went instead to Peter Pettigrew, which turned out to be a fatal mistake, as Peter was, unbeknownst to them, a spy for Voldemort. When James and Lily were murdered by Voldemort, Dumbledore was devastated. Albus later became a mentor to James's son, and they shared an intimate relationship, more like a grandfather and his grandson, rather than a headmaster and his pupil. Dumbledore often sympathised with Harry about the grief and loneliness caused by his parents' death, and would comfort him at times when he really needed it. He also firmly believed and emphasised many times that Harry's love for his parents, James and Lily, was the reason why he had a power stronger than Voldemort's. Minerva McGonagall was the Transfiguration Professor and also the Head of Gryffindor House, at the time James was a student. McGonagall was simultaneously fond of, and exasperated with James: she knew that he was a mischievous trouble-maker and often played cruel pranks on some of his school rivals, such as Severus Snape, but she also knew that he was a clever and talented wizard, and essentially a good person; overall, they had a good relationship, which presumably improved significantly after James cleaned up his act, and became worthy of being made Head Boy. During the First Wizarding War, they were both members of the Order of the Phoenix and fought in many battles against Death Eaters. Upon learning of James's and Lily's deaths a few hours after they were murdered, McGonagall was devastated, and barely managed to keep her composure. In her later years, she shared quite a close relationship with James's son, Harry. James did have a good relationship with the most members of the Order of the Phoenix, during the First Wizarding War. He might have been friendly with some members, such as Elphias Doge and Alastor Moody, as they were all members during the first war and most likely fought in several battles together. It is possible that James had many other friendships during his time in the Order, but they were unknown; his most famous friendship being the one he shared with the Marauders. The most members of the Order were killed during the Second Wizarding War; only a few of them managed to survive. –J. K. Rowling on why James particularly hated Snape. James is played by Adrian Rawlins in the film adaptations of Harry Potter and the Philosopher's Stone, Harry Potter and the Goblet of Fire and reprised the role for Harry Potter and the Deathly Hallows. In the film adaptations of Harry Potter and the Chamber of Secrets, Harry Potter and the Prisoner of Azkaban and Harry Potter and the Order of the Phoenix, footage from earlier films was used. In Order of the Phoenix, James was played as a teenager by Robbie Jarvis and as a child by Alfie McIlwain in Deathly Hallows: Part 2 in flashback scenes. This means the only film adaption which James doesn't appear in is Harry Potter and the Half-Blood Prince. By an interesting coincidence, Rawlins was also born on 27 March. In the film version of Harry Potter and the Philosopher's Stone, James was said to have been a Seeker. However, J. K. Rowling has stated that James was a Chaser. To date, the Harry Potter Prequel is the only story to feature James while he was alive. All other appearances have either been as an echo or as a flashback. In the last film, in Snape's memory, it shows that James was killed at the top of the staircase instead of in the living room. In the film version of Harry Potter and the Order of the Phoenix, James is depicted as having brown instead of black hair. In the movie adaptations, James appears to be much older than he was intended to be, being only twenty-one years old when he died. In Harry Potter and the Deathly Hallows: Part 2, a young James is shown without glasses. However this can be explained as his eyes became weak and the fact that his father did not wear glasses. Rawlins reprised James' role for the video game adaption of Harry Potter and the Deathly Hallows: Part 2. James was the only member of the Mauraders not to live to the 1990s. If James had lived, he would have been in his late thirties during the Harry Potter storyline. This page was last edited on 1 July 2015, at 14:14. This text is available under the GNU FDL and may have been adapted from the Wikipedia article about James Potter I (history).